Dreamhost Backup problems; stay away from them! So it seems Dreamhost have once again lost all my files on their backup server, or at least I've lost access to the them... This whole ordeal started more than three weeks ago, though I didn't notice it at first. At one point they sent out an email explaining and apologizing for what's happened, so far so good, accidents can happen.. But they email also said that now it was OK to reupload the files, and a few days later they seemed to be gone again. Two months ago I got myself a 50GB backup account for personal use (photo library, documents, code and such), and played around with rsync until I got a working backup script. However, for some deranged reason, I never actually got around to scheduling the backup script to run every night... Well, now I felt it was time to remedy the situation, and maybe write another blog-post while I was at it. At the very same second I decided this, an email arrived from my backup hosting company (Dreamhost) with the ominous subject "Backup server problems"..! Now, honestly, what is that? Fate? Can they read my mind or what? This is seriously creepy...! At the moment, it is really starting to look bad, and we have more or less given up hope on being able to recover the data. Again, I'm really horribly sorry about this. Hopefully, as this loss only affected our "backup" service (intended to only be used as your backups), you have another copy of all the data that was there. We have now at least gotten the backup server back online (without any 3Ware raid cards this time), so you may begin using it again to re-backup your data. To try and make up for this a tiny bit, I have just now applied a $20 account credit to your account. (The total of any amount you've been charged for backups since October, plus extra.) Again, I sincerely apologize for the inconvenience. If you have any questions, please respond to this email and we will all do our best to help you in any way we can. So, it turns out the they had begun experiencing problems with their backupserver about two weeks ago. Since my backup script hadn't been running I hadn't even noticed. But get this, in the end they were unable to recover the data, and gave up! All data on the backup server gone. For everyone! And yes, when I logged in now my backed up files were nowhere to be seen. My local backup-folder is actually a collection of symlinks (yes you can use symlinks in Windows, but they are called junctions) pointing to the folders I actually want to backup. As you can see rsync is not so difficult to use (the protocol=29-stuff is Dreamhost specific, my thanks goes to Climens Codelog for the tip). UPDATE: Dreamhost messed up again! The files i uploaded yesterday are gone! Nothing new in the Dreamhost Status blog... What's going on? I know I said that I would switch to Mail.app, but somehow I still use Thunderbird from time to time... Anyhow, Thunderbird 3 beta 2 was released a few weeks back, so for those who thought that beta 1 sounded too unstable, maybe now it's time to give Thunderbird 3 a try? As I've said before, for me the main reason for updating is that Thunderbird 3 natively supports the OSX Address Book! When I made the switch to Mac and OSX, for some reason I stayed reluctant to trade my old trusty Thunderbird for OSX' native Mail.app. But unfortunately Thunderbird doesn't support the pesky Outlook calender invitations my company always spam me with, and I heard a rumor that Mail.app does, so I thought I had to give it a try then after all. It turns out however, that I really, really, really, miss the three column vertical view from Thunderbird (and Outlook for that matter). For some strange reason Mail.app sports the older 2 column split mode... Fortunately, as always, Google has the answer. 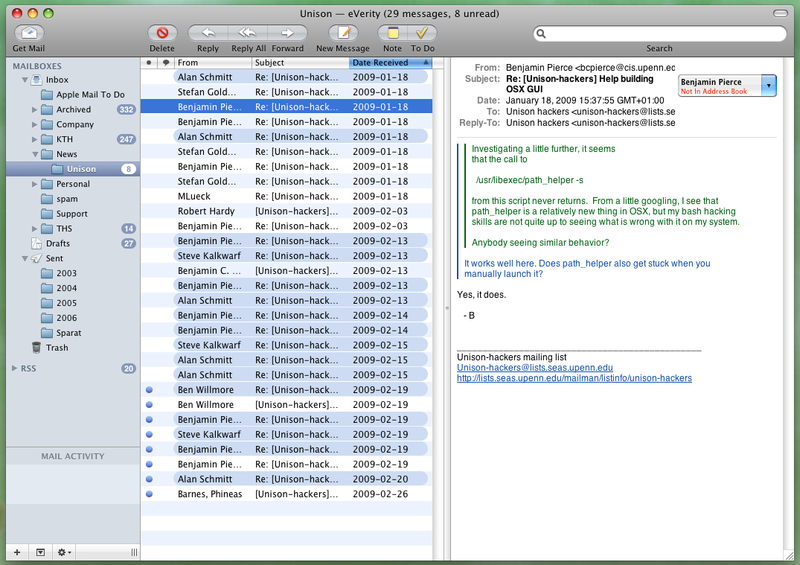 I quickly found WideMail by Dane Harnett, a modification to Mail.app that enables a three column view just like in Thunderbird. Also has many options to further customize the appearance. Thanks Dane! Albin Rangefelt is a Software Engineer working at Google in Zurich.